Best addition option. Need extra living space? Finishing your basement can cost just half of what you'd pay to build an addition. 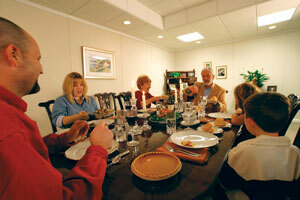 An in-law apartment can be the perfect solution for older relatives who you want to remain close to you. Total Basement Finishing by Energy Swing Windows installs beautiful, new in-law apartments that will not only provide you with extra space, but will enhance the overall value of your home and keep your basement healthy. In-law basement apartments is a beneficial alternative to creating an addition on your home, saving you the hassle, expense and time consumption. We build in-law apartments for basements throughout the Greater Pittsburgh area. Call us today for a free quote on your basement finishing project! Larger windows are a great addition because of the additional natural light they provide. In most areas, the local building code will require any basement bedroom to have a safe, direct means of egress to the outside. 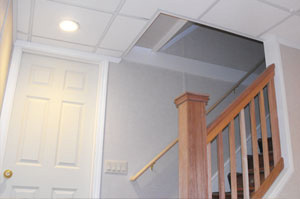 In a walkout basement, egress can be provided by a door. 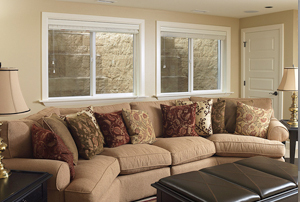 Otherwise, a standard basement window opening can be enlarged to install a larger egress-compliant window. An accessible bathroom can be a good idea for an in-law apartment. Photo courtesy of Kohler. 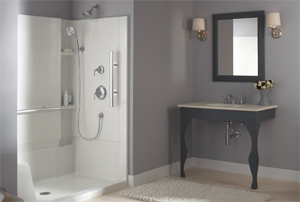 Older people and individuals with disabilities often require special features in a bathroom, such as grab bars and curbless shower stalls. Fortunately, a wide range of bathroom fixtures are available for differently abled folks. It’s less expensive to incorporate these fixtures during new bathroom construction than to retrofit them at a later date. Adding a doorway helps to isolate basement noise and provide privacy. Privacy and soundproofing are important when you create a basement apartment. That’s why you might want to enclose the bottom of the basement’s interior stairway. This treatment creates an entry vestibule at the base of the stairs – an extra layer of separation between the apartment and the house. No matter who is living in your basement apartment, you'll want them to be comfortable. An economical way to provide heat in a basement apartment is to install electric baseboard units that can be controlled by a thermostat. But to hold that heat in and reduce your heating costs, you'll need to insulate your basement's foundation walls with rigid foam insulation. The best way to keep humidity levels in check is to rely on a SaniDry® dehumidifier from Basement Systems. This ENERGY STAR® dehumidifier is designed to automatically maintain the humidity level you select, while also removing dust and other particulate irritants from basement air.